The QRM-10P provides stable resistance readings of very large transformers by utilizing a 36Vdc power supply capable of outputting up to 10 Amperes. 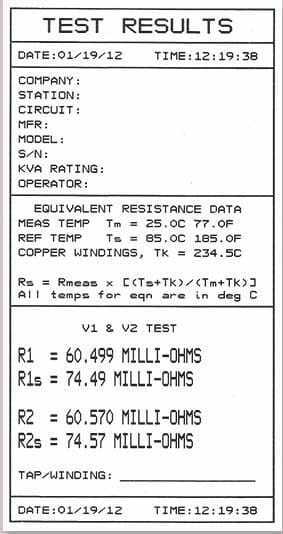 The resistance reading of a 100MVA transformer can be achieved in 5 minutes or less. The unit’s power supply is cooled by heavy-duty fans designed for continuous operation. For greater flexibility in the field, the QRM-10P comes with a built-in 2.5-inch wide thermal printer used for printing test reports. 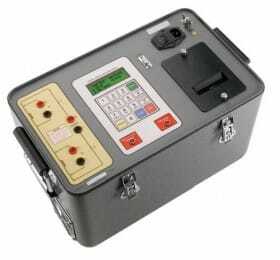 At the end of each test, the QRM-10P automatically dissipates the stored energy in the transformer. This discharge circuit will continue to work even if the supply voltage is lost. For added safety, the unit’s power supply is thermally protected from over-load damage. The QRM-10P can store 63 test records (up to 48 readings per test record) in Flash EEPROM. Test records can be retrieved and printed on the built-in thermal printer or can be transferred to a PC via the RS-232C interface port. Windows® -based software is provided with each QRM-10P that can be used to retrieve test records from the QRM-10P and can also be used to export records in Microsoft® Excel format. The QRM-10P features a back-lit LCD screen (20 characters by 4 lines) that is viewable in both bright sunlight and low-light levels. A rugged, alpha-numeric, membrane keypad is used to control the unit. The QRM-10P features a built-in 2.5” wide thermal printer that can be used to print test reports in the field.